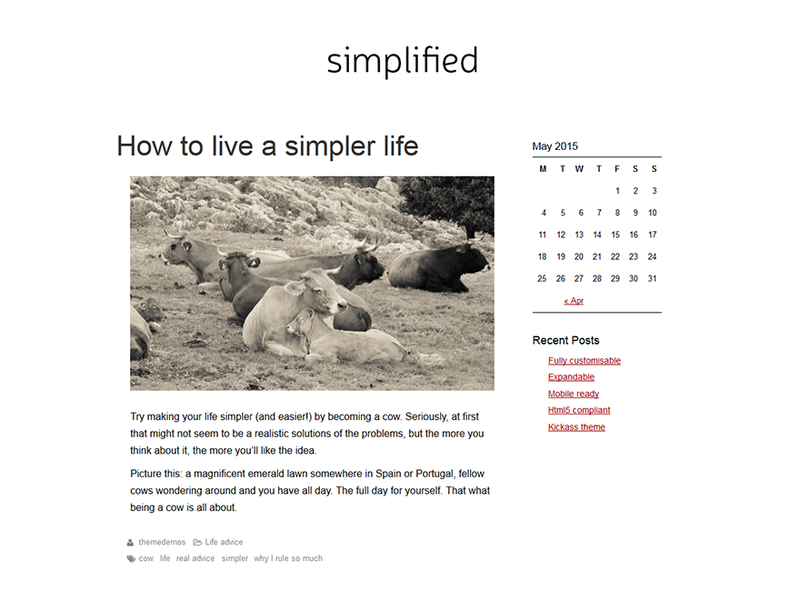 Simplified Blog is a hassle-free theme. You can customize text, links, heading, meta, background colours, fonts (from google fonts), upload your logo and start blogging right away. No need for css editing. Simplified is customisable from admin screen. No manual html/css editing. Simplified is optimised for viewing on mobile. Google rates it as “mobile friendly”. Simplified uses valid html5 and css. It is built to the highest standards of coding. You can choose from the selection of Google fonts for headings and text. You can use Simplified as a basis for your own theme. It is complete yet not exessively styled. If you find a bug — we will fix it. Simplified is free and can be used for commercial projects. If you want even more features and want to support me as a developer — consider buying the Simplified Pro theme: premium version of this theme with more fonts, incredible premium widgets and a year of support. I also offer paid installation and customization service for the Simplified Theme. Simple installation and customization of my theme for your blog costs only $40 and will take 1-3 days. Use contact form below to message me. Mention that you want paid support and describe what exactly you want. I accept payment via PayPal. If you need more significant customization, creation of child themes or custom plugins – contact me for a custom quote!